As one of the only general dentistry offices in all of Connecticut with a permit to provide sedation dentistry, we receive lots of questions on how the actual process works. It helps that we’ve assisted hundreds of fearful and anxious patients with their dental needs using sedation. We’re happy to explain to prospective patients how the process works and what to expect. The detailed steps of a typical visit are listed below. But if we were to summarize, moderate sedation will relieve you of all your dental fears and phobias, thus allowing you to receive the care you need. Although very few of our patients remember anything, many of them will describe exactly what you see in our logo – like you’re floating in the clouds! You will meet with Dr. Calcaterra and his sedation team to discuss your unique case. He has completed hundreds of cases – and each one is unique! We will develop a plan to address your specific needs for your sedation appointment(s). Your medical history and current medications will also be reviewed. Dr. Nick may evaluate some or all of your vital signs. In some cases, he may need to consult your physician or other provider caring for you. Our #1 objective at all times is to make sure your sedation is safe. At this point, we will collectively decide if we will do intravenous or oral sedation or both. If you are really nervous, Dr. Nick can prescribe you an oral sedative to take the night before and/or the day of the appointment. This will allow you to be relaxed even before you walk in the door. Scared of the IV? We can give you nitrous and a relaxing pill so you are sedated before we start the IV. You arrive. Nearly all of our sedation appointments are in the morning due to the fact that you must not consume any solids nor liquids for 6 hours before. You will be seated in one of our comfy, modern dental chairs and we will hook up our various monitors. 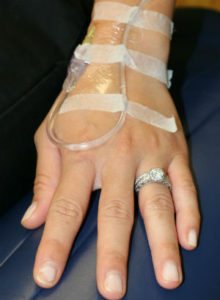 For some patients, the IV can be very intimidating. In these cases, we can give an oral sedative and/or administer nitrous oxide to relax you to allow for the IV to be initiated. This works nearly every time! A minimum of one staff member – always a female – is in the room at all times in addition to Dr. Calcaterra. We’ll also confirm with you and any family members the procedure(s) we will be doing. We will then begin to administer the sedation medications. If we are doing IV sedation, it will consist of a sedative (usually Versed, a.k.a. midazolam), an opioid (usually fentanyl), and sometimes nitrous oxide gas. If we are doing oral sedation, we will administer triazolam (brand name Halcion) and nitrous. We will review the post-operative instructions with your companion. You remain in the chair until the effects of the sedation have worn off. You will then leave the office – sometimes in a wheelchair – or sometimes on your own. A happy sedation patient at the completion of his appointment. Our medications produce such amnesia that he remembers nothing of this photo – let alone anything of the procedure! We will check in with you that night. You will have little to no memory of the procedure. You will still be in disbelief that you don’t remember anything. You will think sedation dentistry is the best thing in the world! Still have questions? Interested in having a consult? Call us (203) 799-2929 or visit this page to request an appointment.